iPad has become the industry standard, thanks to Apple’s stellar App Store, best-in-class design and intuitive user interface. There is a tough choice when it comes to buying one. Now, for the first time, Apple is offering four different models of iPads. Hence, making the decision of which one to get, becomes much harder. So how do you decide which iPad is best for you? Don't worry. Thanks for Geekiest-Tradepub association, we now have an eGuide available to you. This guide will help you choose the best iPad for you use, as this guide is written by LAPTOP/TechMedia Network and they tested and rated all the iPads based on design, features, performance, battery life and value. 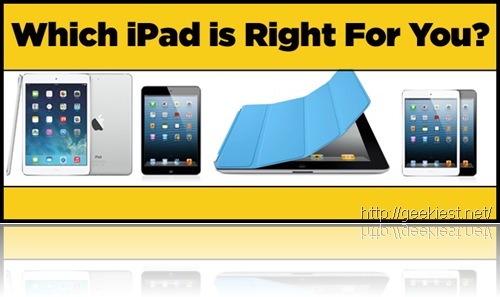 So, check out here which iPad is best for you!